I realize I’ve been a little M.I.A. lately, but I have a good excuse! I have started to use my organizing skills in a new way. As you may know, the grant that made my position possible at the San Francisco based Jewish Community Federation and Endowment Fund reached its successful completion early this spring. So, after many years, I left the work of advancing the lives of LGBT Jews in the very capable hands of Sasha T. Goldberg who is the Bay Area Director of Keshet (info). I am still in the loop: I still serve on local committees for JCRC, NUJLS, and Keshet, proudly claim my membership at Sha’ar Zahav, as well as continue to be involved in the work of a variety of groups. After only a few months consulting outside of the Jewish community, I accepted a temporary position with the New Israel Fund as Interim Regional Co-Director while Becky Buckwald is out on maternity-leave through August. I am already deep into helping with the Annual Guardian of Democracy Dinner (info), shaping the logistics of NIF’s International Board Meeting and promoting local events such as Love, Hate and the Jewish State (info). Working with the brilliant folks like Orli Bein, Steve Rothman, Daniel Sokatch, Penina Eilberg-Schwartz, Hannah Ellenson and Etai Freedman has already given me an incredible opportunity to engage with topics that I care about in a whole new context. This new professional chapter for me has just started and already it has been incredibly rewarding. While I don’t know where I am specifically going to land again in September, I do know that I’d like to continue using my organizing skills for a cause I care about, but that could of course could be within a variety of areas. I’m open to ideas and I want to hear from you! I’m excited to see what happens next! Much love and hope to see you soon! Since 1999, November 20th has been set aside in cities across the country as Transgender Day of Remembrance. This day memorializes those who have been killed due to anti-transgender hatred. High rates of murder and other violence continues to be one of the most critical issues facing our transgender communities; and more and more people, trans and non-trans, are raising their voices in commemoration and protest. This Friday evening marks the sixth year that San Francisco’s progressive reform Congregation Sha’ar Zahav has stepped into the role of Jewish community caretaker for the annual sacred event of transgender Day of Remembrance (TDOR). More and more people, trans and non-trans, are raising their voices in commemoration each year. This particular evening, open to the greater community – both Jews and our Jewish allies, will be focused on remembering all who have suffered from anti-transgender violence. The service beginning at 7:30pm led by Rabbi Camille Angel and Martin Rawlings-Fein will be focused in part on the holy act of remembering. May each of these names be for a blessing. I understand from the blogsphere that many in the Orthodox tradition are dismissing the wedding as both of the grooms are men. Although no one has asked me my opinion on the matter here it is: of course it counts. The grooms were married in Washington D.C. by Rabbi Steven Greenberg, author of the 2004 groundbreaking book Wrestling with God & Men: Homosexuality in the Jewish Tradition. Out of all of the blog coverage on this possible Orthodox first my favorite post can be found here. Video clips from the wedding ceremony can be viewed on Roee Ruttenberg’s +972 blog. Click here to read the Jewish Journal’s profile of Rabbi Steven Greenberg. My colleague in Washington D.C., who like me works to break down obstacles in our communities paths to living Jewishly, responds to the article, “Bridging the gap between faith and sexuality” (WJW, Oct. 20) in the brilliantly written (and re-posted below) letter. This article that my colleague writes about seems to express a limited capacity as to the centrality of Judaism in the lives of many that are outside of a hetero-normative experience. This evening I am speaking on a panel hosted by Spectrum, Marin’s LGBT Center. We will be talking about how different religions handle biblical prohibitions against homosexuality and on the role religion plays in helping make meaning of our LGBT lives. I anticipate questions about how LGBT Jews continue to look beyond words written in Torah as well as how it is that so many LGBT Jews continue to love a community of cultural relevance, faith and spirituality when some continue to foster feelings of marginalization for LGBT Jews and our steadfast allies. I have a few answers to these questions, including boasting about how extraordinary our local Jewish Editorial staff is, but I would prefer to give them in person, so if you are up for a conversation please join us. Meanwhile, read this letter as it has been ‘cut and pasted’ from wjw: “What GLOE works to counter everyday. As a proud member of both the Jewish and GLBT communities in Washington, I was hurt and outraged to find that Washington Jewish Week seems to state that these communities are mutually exclusive. As the director of GLOE, a program of the DCJCC, I know that they are not. The article “Bridging the gap between faith and sexuality” (WJW, Oct. 20) stated “While the Torah strictly prohibits homosexual behavior” as a fact without question. Such a qualifier does a tremendous disservice to all GLBT Jews and undermines the effort to build a more inclusive community. 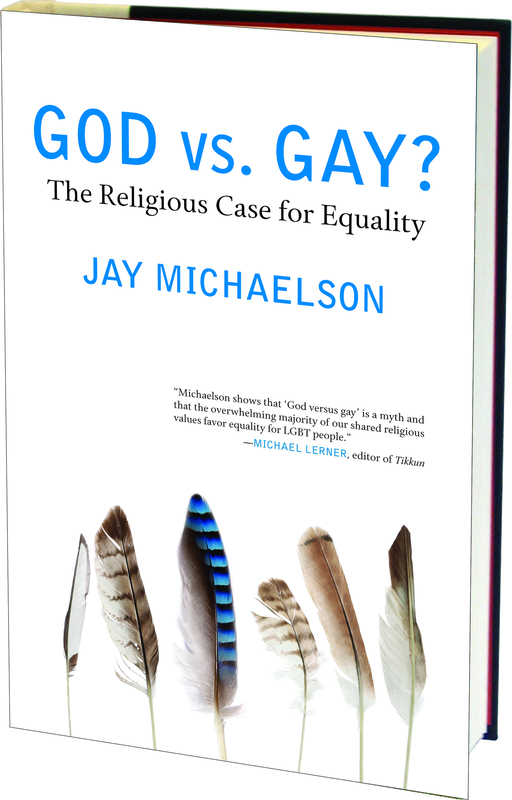 Jay Michaelson’s book, God vs. Gay? : The Religious Case for Equality, discusses the common misconceptions around this supposed biblical prohibition. Since this book, its author, and the surrounding program at the DCJCC were the topic of the article, I found it incongruous that the piece introduced Michaelson’s thesis with a dogmatic interpretation of the Torah. Even more importantly, the biblical imperatives towards love, community, justice, family, and saving a life, both vastly outnumber and outweigh any other verses one might “strictly” quote. WJW is an important voice in our community and the articles, images and words it chooses to print carry significance. That phrase, which betrays a bias toward exclusion, has repercussions throughout the community. I worry your readership will see this factually-stated interpretation and believe it to be true. Further, I am horrified to think of the closeted gay kids in our Jewish community whose parents receive this paper. Seeing an article in a Jewish paper that speaks to a gay and Jewish identity is a rarity for them. When they read beyond the headline, that “who you are is strictly prohibited in the Torah,” it only serves to shame them and to alienate them from Judaism – something GLOE works to counter every day. Participating student leaders from Universities across North America began calling this annual gathering a conference of the National Union of Jewish LGBTQQI Students. Naturally, an abbreviation written as NUJLS followed this long-winded title, giving us the name of the conference that we still use today, NUJLS (pronounced "NuJoules" (nüjau(-ə)ls)). In the fall of 1998 the Office of Student Life at the University of Oregon received a notice in the mail about a student leadership conference aimed at empowering GLBT Jewish leaders. The Dean who received the memo called our local Jewish Student Union, LGBT Alliance and Hillel House to recruit someone to represent the University of Oregon at this conference called NUJLS. I was nominated, grant dollars were dispersed, I flew to Texas, met a dozen new friends and learned about Jewish community leadership. Just like that my career, as I write about in this blog, discovered its roots. From my perspective one of the many barriers that people experience into the organized Jewish community was eliminated for me. Representing the University of Oregon as a Gay Jewish leader, gave me the opportunity as a young person to easily navigate into the depths of what our Jewish community has to offer. Each Spring since 1997, Queer Jewish University-level students, as well as our steadfast LGBT allies, have joined together on a selected University campus to learn from each other for a weekend Shabbaton affectionately called NUJLS. Each year NUJLS features speakers, text study, and workshops on topics such as Judaism and queerness, activism, relationships, ethics, coming out, and time to talk about our differing views on how students think about Israel. NUJLS provides an opportunity for student leaders from Universities across North America to build community, network and become more familiar with Jewish life. This February at American University in Washington D.C. students will be able to hear from galvanizing speakers, share shabbat meals and participate in leadership workshops all the while fostering in the next generation of connected and inspired LGBT Jewish leaders. As an alumni of NUJLS and now a proud board member I am asking my networks to help me spread the word on campuses and in your greater communities about NUJLS. Learn more! This is a gender neutral restroom. Out Gay Hillel Students at American University in DC: Oy J! We speak about removing barriers for people often at my work in the organized Jewish community. These barriers we speak about can often mean finances but they can easily be much simpler and much more tangible. These barriers can be a physical or mental block that keeps someone in the margins not able to get access to what our Jewish community has to offer. 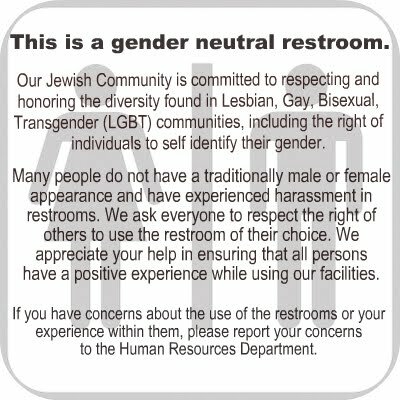 Here is a barrier that we don’t speak about a lot in the organized Jewish community: restrooms. Many people have no safe places to go to the bathroom. It is true! Ever wonder about the gender of that long-haired person in the men’s room or that short-haired person in the woman’s room? Imagine the looks that they get each time they simply have to go to the bathroom because their gender presentation does not fit the mold of other people around them. Many people avoid public bathrooms altogether because these looks can quickly turn into harassment. A copy of the sign that you can see in this blog is now hanging on our third floor outside of a restroom that was once reserved solely for use by men. A few years ago we put up a sign that simply said “gender neutral” but guests in our building kept referring to it as the “transgender bathroom.” This awkward phrasing that was being used started to create an even more isolating experience for both guests and employees. So together with two of my colleagues we were able to craft this updated sign. I don’t always know how to honor each one of our community’s micro successes in the LGBT inclusion work that I do. We do not even know yet if this new sign can be seen as a success. I simply hope that this sign and story can present an opportunity to shape the way we can see things differently as a community. I am aware that we need to share these moments of change to help other communities take similar steps towards greater inclusion. So if you have a suggestion on a success that you have experienced, please share it! Toilet Training – a documentary video and collaboration between transgender videomaker Tara Mateik and the Sylvia Rivera Law Project. Using the stories of people who have been harassed, arrested or beaten for trying to use bathrooms, Toilet Training focuses on bathroom access in public space, in schools, and at work. West Coast LGBT Training Institute for the Jewish Community – The purpose of the training is to make sure that LGBT youth, families, and staff are safe and affirmed in all Jewish educational and community settings. Participants will be trained and given the tools and guidance to replicate the trainings in their own communities. 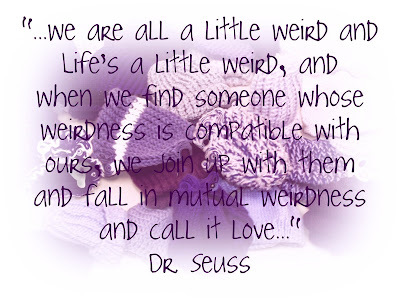 do you have a purple scarf?